The “garden city” vision was first introduced by the former Prime Minister Lee Kuan Yew in year 1967. Since then the government has been committed to the greening programme – a minimum of 10,000 saplings are planted every year in the Tree Planting Campaign. In 2017, a research from the Future Cities Laboratory at the Singapore-ETH Centre shows 70% of shade in local streets comes from vegetation. Singapore’s journey to become a Garden City started with detailed urban planning, and over the years local and international corporations help contribute with different eco-friendly buildings. Let’s take a green architecture walk and see a few sustainable architectural landmarks. 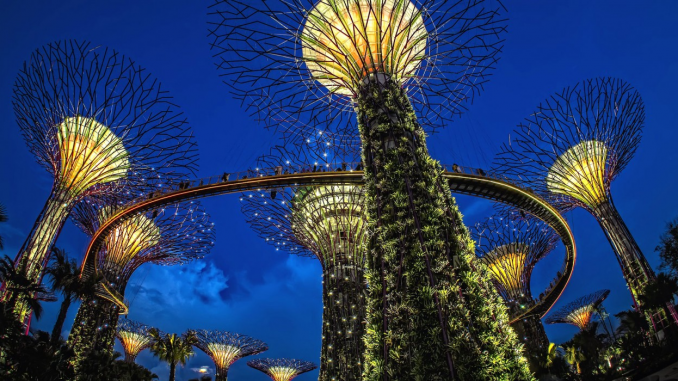 Spanning 101 hectares of reclaimed land in central Singapore, Gardens by the Bay consists of three waterfront gardens: Bay South Garden, Bay East Garden and Bay Central. Bay South, designed by UK landscape architects Grant Associates, has garnered 16 awards including Skyrise Greenery Award, The Landscape Institute Awards 2013 for Climate Change Adaptation and World Building of the year 2012. The 18 eye-catching Supertrees not only look stunning as vertical gardens, they also generate solar power, act as air venting ducts and collect rain water as well. The iconic structures harmoniously blend nature, technology and sustainability to create a unique outdoor leisure experience. For those who love art and culture, here’s the National Art Gallery. 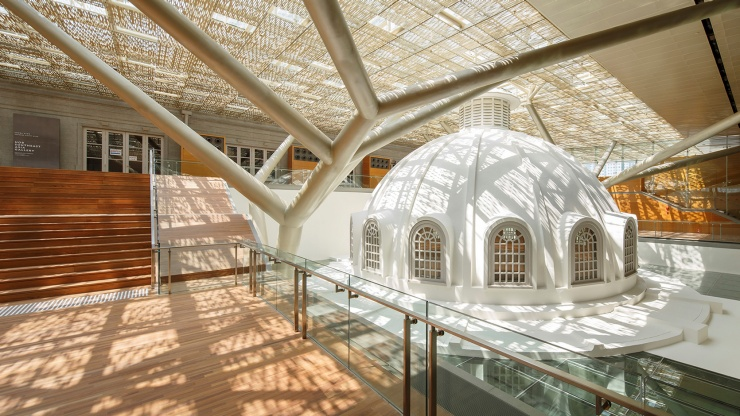 studioMilou Architecture converted two historical monuments – the former Supreme Court and the City Hall – into a major art institution that holds the world’s largest public collection of Singapore and Southeast Asian art. The signature design is a filigree metallic veil draping over each building at roof level to create a subtle union. “This simple and sweeping gesture meant that interventions into each building are minimal so as to respect their architectural authenticity and character,” says Jean-François Milou, the project’s lead architect. The elegant roofing conjures image of finely woven rattan and is supported by tree-like structure. 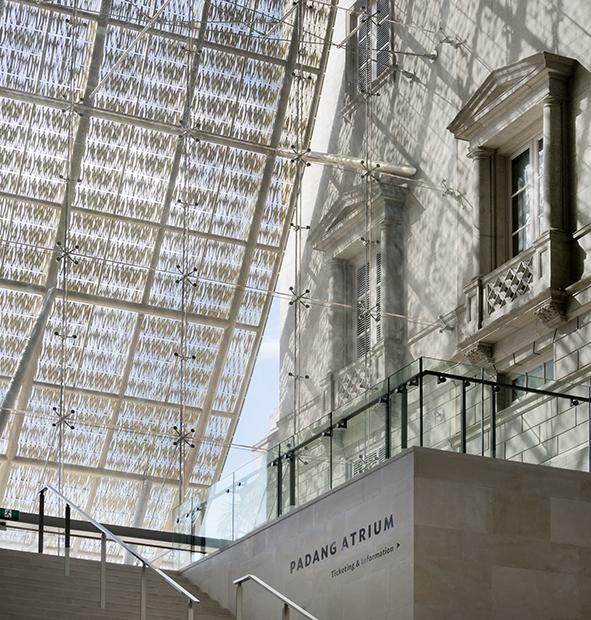 When natural light passes the golden filigree, it gives out delightful waves of soft shadows and allows light to enter the whole building, including most of the exhibition spaces. The last stop is The Learning Hub at Nanyang Technological University. It is the first Asia project by Thomas Heatherwick, a multi-award winning English designer who was awarded with CBE, Commander of the Most Excellent Order, on the Queen’s 2013 Birthday Honours list. The Learning Hub is a collection of 12 handmade concrete towers with a look of giant root vegetable. Each room is cooled using silent convection, and the rooms in turn open onto an expansive naturally ventilated atrium that maximises air circulation. Not only allowing students to feel comfortable while achieving sustainable energy use, the shared central space also “brings everyone together, interspersed with nooks, balconies and gardens for informal collaborative learning,” says Heatherwick. 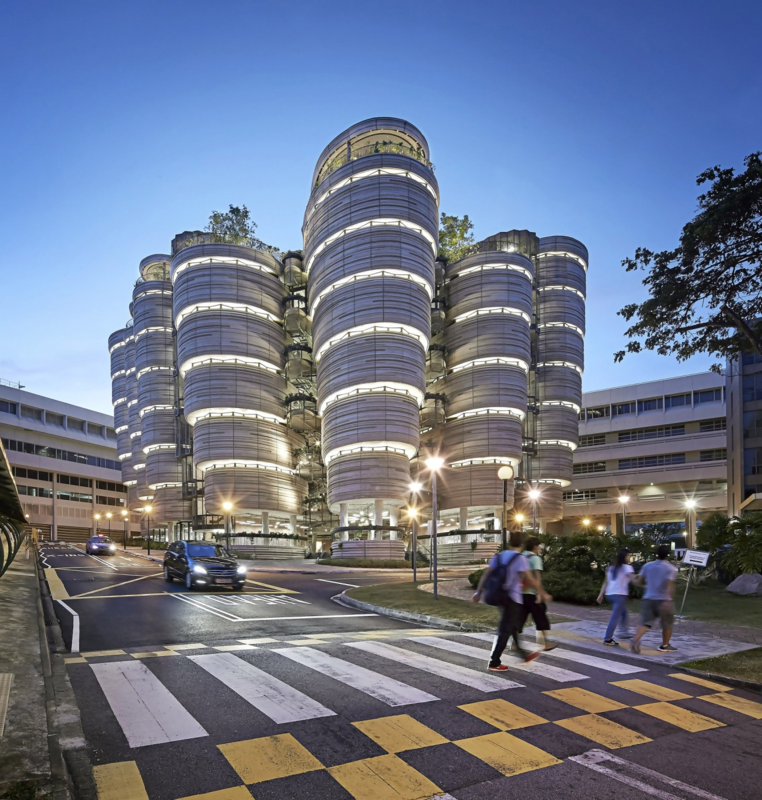 This education landmark was awarded Green Mark Platinum status by the Building and Construction Authority (BCA), the highest possible environmental standard in Singapore. There are many contributing factors to make a building more environmentally friendly. Energy efficiency, water efficiency and materials efficiency are some of the major elements. With the increasing awareness in sustainability, it is encouraging to see more and more architects seek to minimize negative impact on the environment through innovative green building technologies and designs. Sustainable architecture is definitely another big step toward thevibrant vision of Garden City.